Back in 2009, we reviewed the Bergmönch—a scooter that transforms into a backpack. In 2011, one of the stars of the Outdoor Retailer Summer Show was the Skyver Ortovox—a scooter that transforms into a backpack. First and foremost: the introduction to the Ortovox is a sign that downhill scooting might be taking off as a sport. And we do mean scooting, not biking. Like the Bergmönch, the Skyver Ortovox is a scooter. It has no pedals. It has no seat. 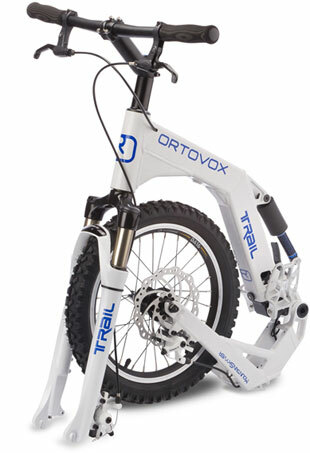 The idea is to hike uphill with the foldable Ortovox strapped to your back and then ride downhill. If the terrain flattens up (or even goes uphill a little) you can give yourself a push forward with your foot. Not incidentally: riding downhill on an Ortovox is is a huge amount of fun (“As close to backcountry skiing as one can get in the summer,” claims Skyver). It also has a practical benefit of letting you traverse longer distances than hiking alone. 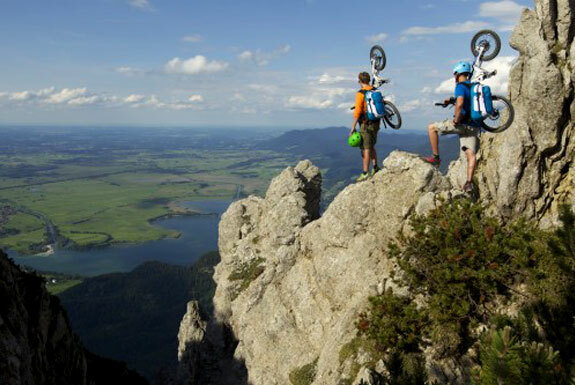 Compared to the Bergmönch, the Skyver Ortovox is a more hearty contraption built for more rugged terrain. The wheels are wider and the Ortovox has built in shock absorbers (either on both wheels or only the front, depending on the model) and a height-adjustable footrests. The tradeoff being that the Ortovox is a bit heavier and significantly more expensive. Sadly, neither the Bergmönch nor the Skyver Ortovox are for sale in North America or Asia. Both are sold in dealers around Europe, mostly around the Alps region. Skyver also sells other types of downhill scooters through their German-language online store. If you do manage to get your hands on a backpack-scooter hybrid, you’ll be at the forefront of an increasingly popular way to travel across mountainous terrain. Enjoy it. And bring along a really good bike helmet.